Maison sur la plage ,ventilée, tout confort de 230m2, sans vis à vis , posée sur un jardin de corail de 1200m2 . Sur une longue plage sauvage, peu fréquentée, proposant des baignoires naturelles sculptées dans le récif corallien pour se rafraîchir . La piscine est sans protection et reste sous l’entière responsabilité des adultes. Une location de voiture est fortement conseillée pour accéder à toutes les commodités et profiter en toute liberté de la beauté de l'île. Moorea , à elle seule , représente tous les paysages de la Polynesie : en forme de coeur et curieusement au centre du triangle maohi , elle présente avec majesté ses montagnes aux pics vertigineux , ses 2 célèbres baies , son lagon aux couleurs légendaires , sa barrière de corail et ses motus (petits îlots) . Cette île se trouve à côté de Tahiti ( 30mn en bateau) , ce qui permet facilement de profiter de ces 2 îles . Les pieds dans l'eau au bord du récif. Aux premières loges pour observer les baleines ( juin à octobre). Paysage similaire à l'archipel des Tuamotus , avec l'avantage d'être à côté de Tahiti . Environnement authentique,sauvage, ventilé, sans vis à vis , avec un contact exclusif avec la nature . Proximité ( 600m) de la plus belle plage lagonnaire de Moorea , du golf de Moorea, à 10mn en voiture du quai des ferrys, des commerces, banques, médecins, restaurants. Une maison très agréable et aménagée avec goût. Nous avons passé un excellent séjour! Entre la piscine et la plage, nous avons bien profité de la douceur de Moorea . La maison est au calme dans un cadre de rêve ! Vous avoir reçu fût avec plaisir et grand merci pour vos compliments ! My wife and I were so grateful for the week we spent at Jean-Marcs amazing ocean front home. The home is generously appointed with everything you will need for an extended stay. The home is constructed with beautiful open wood framing and the decorations and numerous pieces of décor is whimsical and charming. The house has air conditioning in 2 of the 4 bedrooms + loft. Each bedroom has an en suite bathroom. The main bedroom is so beautiful and spacious. It is not one of the air conditioned rooms and the evening warmth and humidity in Nov was a bit too much for us Pacific Northwest residents to utilize it. The air conditioned room we used was very comfortable and has plenty of space for everything. The kitchen is fully equipped to which took full advantage of as we only went out to eat one time during our 7 day stay. This house is so nice we spent a lot of time just hanging out relaxing in the pool, cabana and taking in the ocean views, smells and sounds of waves rolling into the reef. It’s also very private! Jean-Marc is lovely host and can’t thank him enough for his generosity and thoughtfulness. We arrived on the late Sunday ferry. And most places of business are closed on Sundays. Jean-Marc literally stocked the fridge with groceries. Meats, cheeses, eggs, water and even some beers! He also loaned us a cell phone so we could make local phone calls as needed. Te’mae beach is 30 seconds away (by car) and offers up a great beach with outstanding snorkeling. Having a car is a must. It is very easy to get around Moorea and traffic on the road is light. The gardens and pool are tended to each morning. There is a very good market about 7 minutes away just past the ferry dock. 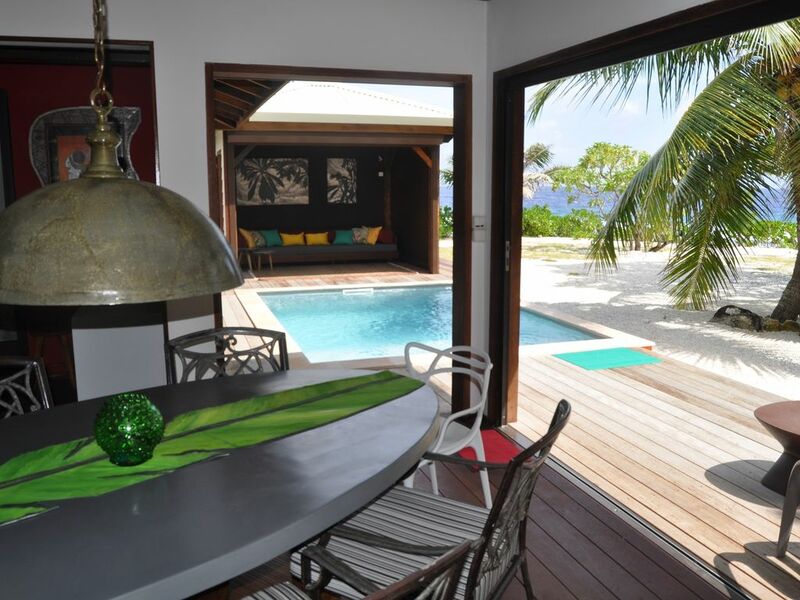 We spent 3 weeks on 4 islands and Jean-Marcs Moorea home was easily my favorite property. et au grand plaisir de vous revoir de nouveau! My husband and I invited a friend from New Zealand to join us somewhere half way between our home in Seattle and our friend's home in Christchurch. After much searching, I found Jean-Marc's Tranquil oasis on Moorea. A seven hour flight from LA and a short ferry ride from hustle of Papeete gets you to the laid back tropical paradise of Moorea. The three bedroom home, each with ensuites, is a perfect location for extended family or friends. An upstairs loft area with twin beds and play area makes it perfect for families travelling with kids. Although there was air conditioning in most bedrooms, we did not need to use them with the constant sea breeze and screened window openings. The house is beautifully constructed in traditional Polynesian style with wood beams and woven mat walls. Tastefully appointed with comfortable furniture, large dining table, fully outfitted kitchen, and carefully selected art and treasures. The walls of windows opened the living area to the plunge pool with expansive view of the ocean. Jean Marc constructed a pool side cabana for outdoor lounging with shade. We enjoyed watching sunsets at the seating area overlooking the beach and ocean. The beach out front is white coral and a little more exposed to open ocean, but there is a lovely expansive sand beach with protected swimming and snorkeling just a short five minute walk from the house. Jean Marc supplied us with snorkel gear to use through our stay. Jean Marc is the ultimate host, helpful and informative while consciously respecting our privacy. When we arrived, he arranged to pick us up from the ferry and transport us to the villa. The following day, Jean Marc took us for a tour of the island pointing out restaurants, sites and shopping areas. We realized a rental car is necessary and he helped arrange a reasonably priced car with a local resident who operates a small local business, Jean Marc arranged to transport us to pick up and drop off the vehicle. The island is easy to drive along the circular road that rings the island. People are friendly, proud and helpful, welcoming us always to their island. We enjoyed buying fish directly from the fishermen, and the road side fruit stands provided us with a daily bounty of fresh local fruit. Prices on the island are reasonable. If you are looking at this property for your vacation, do not pass it up. I am now seeking a new excuse to revisit the island paradise and the tranquility of Jean Marc's Villa. Jean Marc is amazing, I highly recommend this property for your stay.